Sponges, dishcloths, and cleaning rags are havens for germs and bacteria, so using them to clean countertops can leave more bacteria behind than were originally there. Use paper towels to clean countertops instead. Thaw food in the refrigerator rather than on the countertop to keep from breeding food-borne bacteria. Specific care, cleaning and disinfection directions will vary according to the material from which the countertop is made. This type of countertop dents, scratches, burns, and stains easily. It is also vulnerable to fluctuations in humidity, so it is a poor choice for use over a dishwasher. Cleanups will be much easier if you seal a butcher-block counter with a least two coats of polyurethane; make sure it is suitable for use on surfaces where food is prepared. Do not prepare raw meat on butcher-block counters. Clean the surface with water and a little dishwashing liquid after each use. Rinse thoroughly and let air-dry. For light stains, scrub the surface using a nylon pad. If the stains remain, apply a diluted solution of bleach directly to them and let it sit for a couple of minutes before rinsing. To remove deep stains, as well as scratches and burns, sand the affected area with very-fine-grade sandpaper. It may be necessary to apply another coat of polyurethane to the places you have sanded. If the countertop is severely stained, scratched, or burned, y0u may want to hire a professional to refinish the surface. 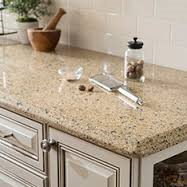 Granite is very resistant to scratches, nicks, and scorching. A granite countertop is almost always treated with a protective seal and is easy to clean. Just go over it with a sponge dipped in water and a mild detergent. To remove stuck-on dirt, use a plastic scrub pad. In bathrooms, wipe down granite surfaces frequently to minimize soap scum. Id soap scum does build up, clean the surface with an all purpose cleaner. To preserve the appearance of laminated countertops, you need to exercise a little care when working on them. Laminates nick and cut easily, so you should never chop directly on them. The advantage od laminated counters is that they are easy to clean. Simply wipe surfaces with warm water and mild detergent. Never allow standing water to remain on the countertop because it can seep through the seams or between the countertop and backsplash, weakening the material underneath. To remove stains, follow manufacturer’s instructions. Marble is extremely porous and stains easily. Only use marble in a kitchen or bathroom if it has been treated with a penetrating stone sealer. Wipe marble countertops routinely with a clean cloth or a sponge dipped in warm water and mild liquid detergent, and dry the surface with a soft cloth. Be careful not to use too much soap and to rinse thoroughly, because soap can leave a film on marble and cause streaking. Soap buildup, is a common problem in marble baths and showers. wipe these surfaces down with a soft cloth or a squeegee after each use and occasionally clean them with a commercial bathroom cleaner that is safe to apply to marble. If you find a stain, apply a paste of baking soda and water to the area, let it dry and wipe it off with a damp cloth. You may be able to minimize damage form oil or grease by sprinkling the area of the spill with cornmeal, leaving it for several hours and then wiping it up with a warm, damp cloth. Some red wine or wine stains can be remove with hydrogen peroxide. These material imitate marble and other types of stone and consist of polyester or acrylic resins combined with mineral fillers. They are sold under various brand names. Solid-surface countertops are much easier to maintain than the stone surfaces they imitate. Knives can easily scar the surface and the countertop mat discolor when exposed to prolonged heat. Clean with a paper towel dipped in a solution of warm water and detergent. Stainless steel is quite easy to clean and maintain, but unfortunately water is your number 1 enemy with these otherwise serviceable surface. It leaves spots, so you should wipe a stainless-steel countertop with a clean dry cloth every time it gets wet. Stainless-steel surfaces usually come clean readily with hot water and detergent. Do not use abrasive scouring powders or scrub pads, they can scratch the surface. Be careful, when using special stainless-steel cleaners because many are formulated for industrial use and can harm a home countertop.